Harry Nott - did he swim to Australia? 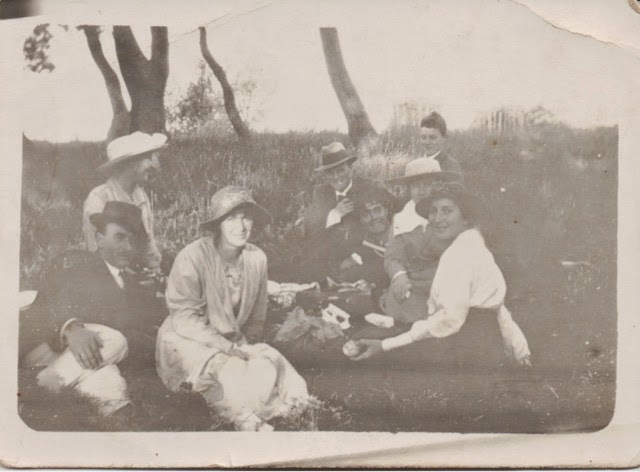 The last blogpost focused on the life of our grandfather, Harold Cooper (Harry) Nott. It noted that his arrival details in Australia had yet to be found.. I'm wondering if this may be resolved through some recent research. We know that Harry was in England in December 1911 as he was a witness to the marriage of his brother, Stan. We also know that he was in Australia in October 1913 when he enlisted in the Royal Australian Navy and, at that time, he was in Western Australia. We also know from the 1911 Census in England that Harry was listed as a Clerk in a Margarine Factory at the time the Census was taken. 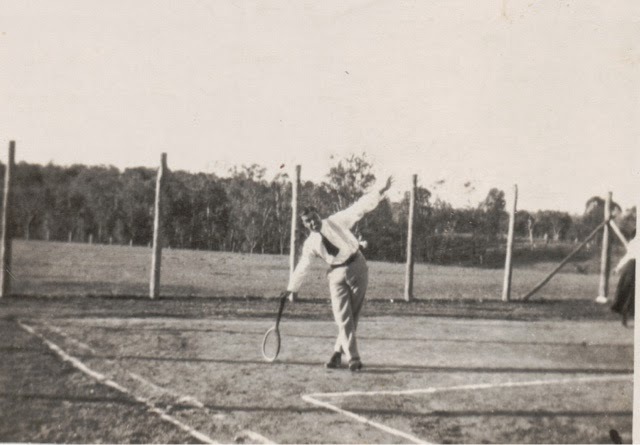 I've recently found an interesting document on the National Archives of Australia website. It is the arrival of the ship "Gneisenau" from Bremen in Germany. It arrived in Fremantle on 14 August 1912. The ship carried a Mr H. Nott in Third Class. He is described as English, aged 21 and a Clerk. 'Our' Harry fits that description exactly! His 'place of shipment' is listed as Antwerp. So, could this be our grandfather? Did he ever mention that he had gone to Germany to catch a boat? Questions that could easily be answered if this sort of family history investigation had started around 50 years ago! If this isn't him, could he have swum to Australia? 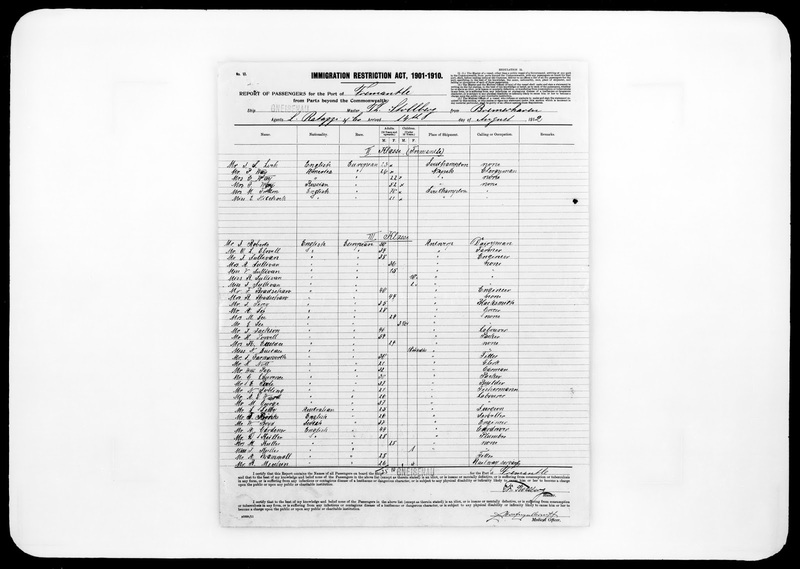 Harry Nott living with his aunt and uncle in Hendon in the 1911 Census. 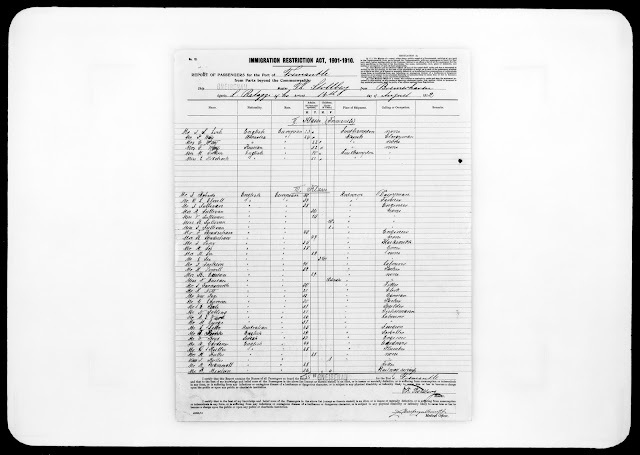 The passenger list of the 'Gneisenau'. Is this our grandfather? 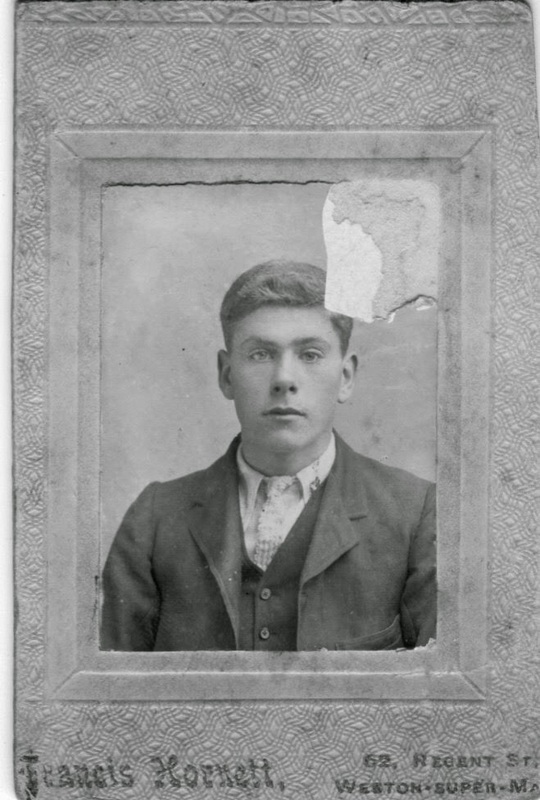 You'll be familiar with William Thomas Bloxham, our almost grandfather and fiancee of our grandmother, Selina Louisa (Louie) Brodbeck, who was killed at Paschendale during the First World War. 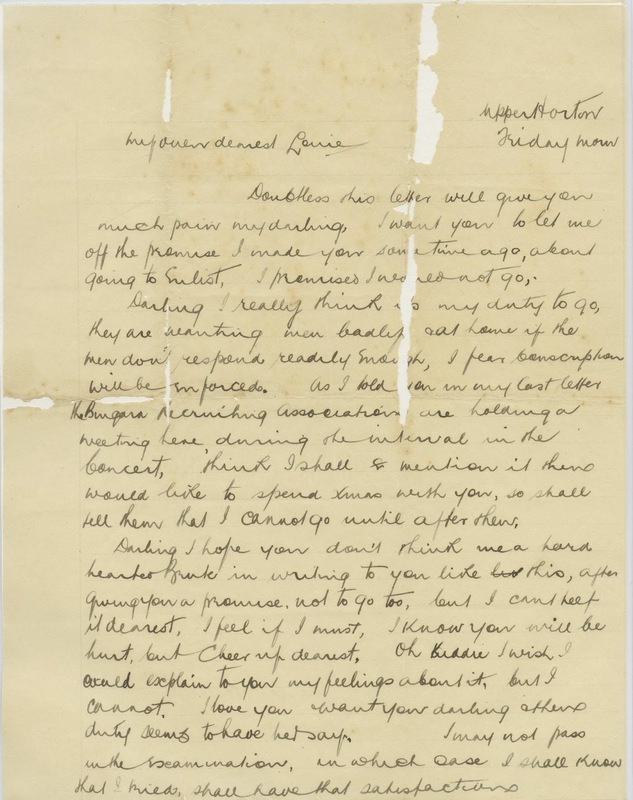 Doubtless this letter will give you much pain my darling. I want you to let me off the promise I made you some time ago about going to enlist. I promised I would not go. Darling, I really think it’s my duty to go, they are wanting men badly and at home if the men don’t respond readily enough, I fear conscription will be enforced. As I told you in my last letter the Bingara Recruiting Association are holding a meeting here, during the interval in the Concert, think I shall mention it then. Would like to spend Xmas with you so shall tell them I cannot go until after then. Darling I hope you don’t think me a hard hearted Brute in writing to you like this, after giving you a promise not to go too, but I can’t keep it dearest. I feel if I must, I know you will be hurt, but cheer up dearest. Oh Kiddie, I wish I could explain to you my feelings about it, but I cannot. I love you and want you darling and then duty seems to have her say. I may not pass in the examination, in which case I shall know that I tried, shall have that satisfaction. Ed Gainen is going to Rose Neath on Sunday afternoon to see some sheep and I shall try and get a seat in the ‘Car’ with him, we can then talk it over. Well darling, I will have to close and get Breakfast. My darling sweet kid, forgive me for causing you pain. Hoping to see you on Sunday. Truest love my own darling. Today, 20 March, marks the birthday of our grandfather, Harold Cooper Nott. So, it seems appropriate to offer a blogpost in his honour. Harold was born on 20 March 1891 at 13 Cavendish Road, Brondesbury, a suburb in the north west of London. He was the youngest child of Tom Harrington Nott and Annie Cooper, the couple having had an older son, Stanley. His birth certificate lists his father as being a Pianoforte Action Maker. This occupation title, while it seems quite innocuous, became, in fact, a fateful factor in the lives of the Nott family. Tom Nott had taken over his father's business of piano manufacturing in Chalk Farm in London in the late 1880s and it is quite clear from an examination of the Piano, Organ and Music Trades Journal that the 1890s were hard times for the piano trade in London. Many manufacturers are listed in each issue of the Journal as going bankrupt or having financial difficulties. Tom Nott was no exception. He appears as a creditor for other businesses and in August 1892, he, too is listed as being in significant financial problems. 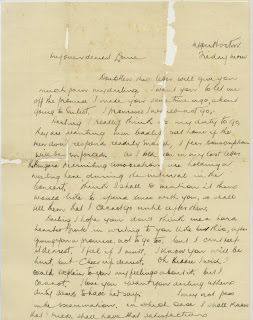 The exact cause of his marriage breakup to Annie is not known but a downturn in business appears to have been a cause from a reading of Tom Nott's letters from the 1920s to Harry. What is clear is that by 1895, Tom Nott had left his family in favour of the United States of America where he settled in Newcastle, Indiana and worked until the 1920s. What of Harry and his older brother, Stan - two little boys left without the protection of the family's breadwinner? We know that by February 1896, the two boys were in Meopham, Kent - then a sleepy village and now a commuter suburb of London. Why the boys were sent to Meopham (pronounced Meppum) is unclear. We do know that the family of the boys' maternal grandmother, Ann Emma Huggett had originated there but the boys were raised by a lady they knew as Aunt Dalton. From research, this lady, Olivia Dalton seems to have been a distant cousin of the Huggetts. Harry and Stan spent their boyhood in Meopham until Stan was 14 when he went to live with their aunt, Betty Thomas nee Cooper in Hendon, London. Harry seems to have stayed in Meopham though by the 1911 Census both boys were living with 'Aunt Betty' in Hendon. So what of Harry Nott and Australia? Of that we know little. The family story is that Harry joined the Royal Navy, came to Australia and then joined the Royal Australian Navy. Of this story, no evidence can be found. Another story told by Stan's daughter, Anne is that Harry came to Australia chasing a woman. Could this be the mysterious Nellie Snape that our Mum and her sister, Auntie Bo used to rib Harry bout as being his girlfriend? Or was Nellie merely a figment of imagination and humour? We are unlikely to ever know. What is known is that when Stan married in December 1911, Harry was still in England as he was a witness to Stan's marriage. Then, Harry appears in Western Australia enlisting in the Royal Australian Navy in October 1913. Harry is right of centre as the Pearly King. Harry served on several naval ships including the Cerberus, Encounter and Brisbane as part of the New Guinea campaign. It is from this period that we have photos of Harry dressed up and performing in concerts on board that he no doubt was instrumental in organising. It was also during his naval service that he met Ross Rowlison who took him back to a small country town familiar to Ross in north western NSW, Barraba. 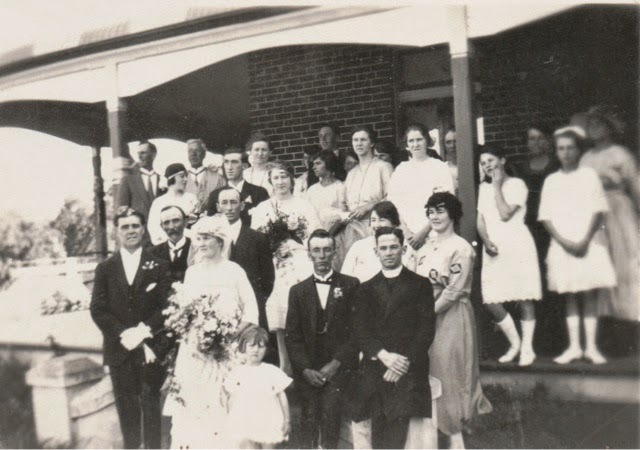 It is here that Harry met and eventually married our grandmother, Selina Louisa (Lou) Brodbeck on 4 January 1922. 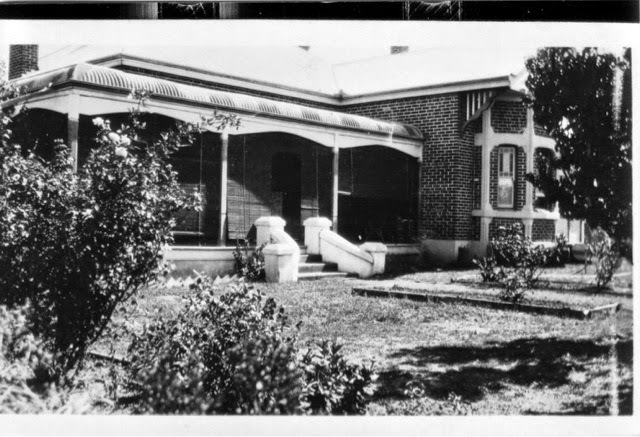 The couple first settled in Payten Street, Ryde where their two daughters Betty and Shirley were born in 1923 and 1925 respectively. They named their house 'Harlou', a combination of Harry and Lou. 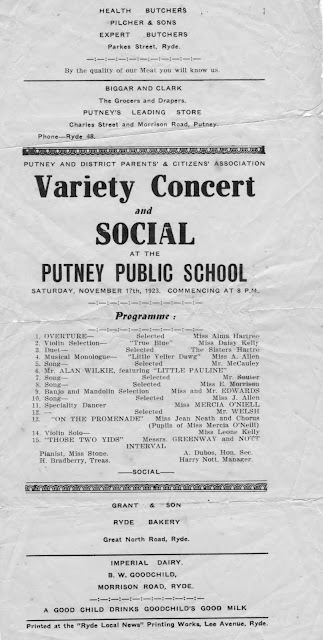 Harry's penchant for entertaining was as alive here as it was in the navy and we have concert programs from Putney and Ryde featuring 'Harry Nott'. 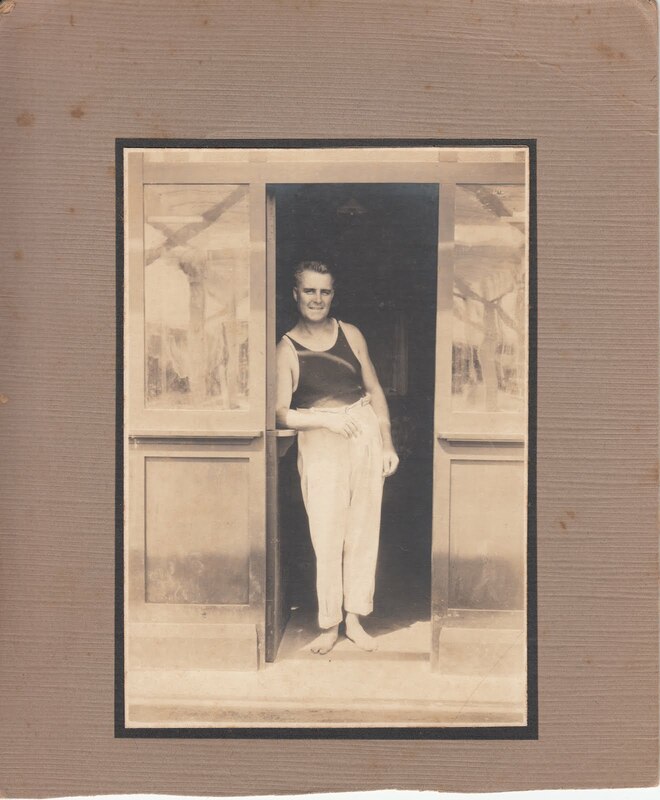 In the late 1920s, Harry was offered and accepted the position of manager of the newly built Memorial Baths in Lismore and the family moved north. The position of Baths Manager was held by Harry for many years until he retired in 1954. Throughout the whole time, Harry was involved in community organisations primarily, the R.S.L and the Soldiers and Sailors Leagues. 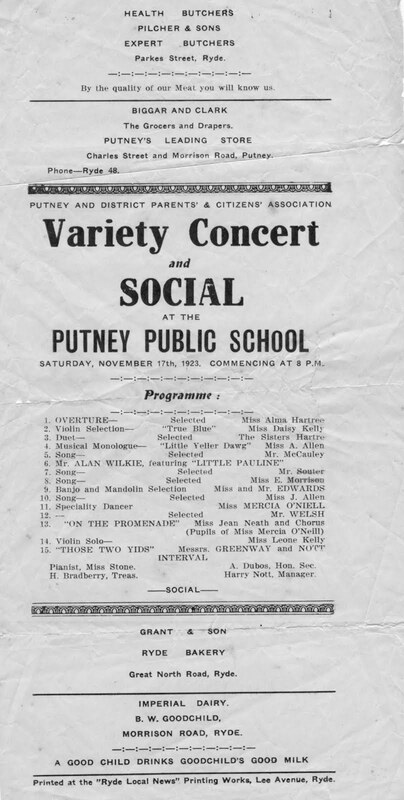 He was also ever present to encourage a growing number of grandchildren to 'do a concert' of an evening. When Harry passed away on 12 May 1967, there were numerous tributes extolling his charity and community work as well as his strong influence on many North Coast residents who he taught to swim. Harry at Lismore Memorial Baths. William Kay was the father of Ethel May Kay who married George Killion. William’s origins are somewhat of a mystery! William married Margaret Dietz on 4 April 1876 at Grafton NSW. 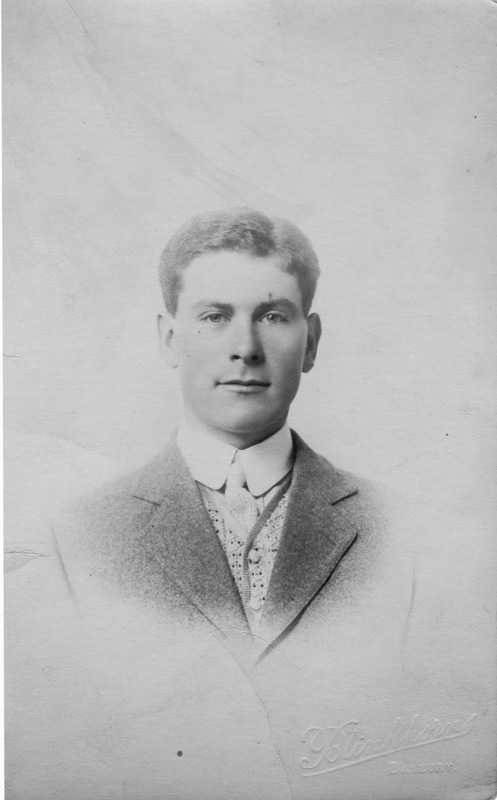 When his daughter, Ethel Kay was born in January 1882, William was described on her birth certificate as being a 27 year old, Cordial Maker and having been born in Burwood NSW. This places his year of birth at around 1855. The birth certificates of his other children and his death certificate place his year of birth in 1852 or 1853. Family folklore conveyed by his granddaughter, ‘Poppy’ Maggs nee Allbutt, states that he was born a Kirkpatrick but was raised by people by the name of Kay and adopted their name. William died on 24 September 1888 at Grafton NSW as a result of a fall from a horse. He was buried in the Church of England Cemetery in Grafton. “Sacred to the memory of William Kirkpatrick, a native of Tasmania, the beloved son of John Kirkpatrick who died by a fall from a horse, 24 September 1888 aged 36 years”. This is followed by an illegible verse. There is no record of a William Kirkpatrick dying in NSW in 1888, let alone one who probably died in Grafton (in order to be buried in Grafton cemetery) and from a fall from horse. This has to be ‘our’ William. A newspaper article in 1946, refers to William as William Kay (not Kirkpatrick) and states he was a native of Tasmania (‘Five Generations Represented’ in The Daily Examiner, 8 May 1946). A birth record for William has not been found to date. 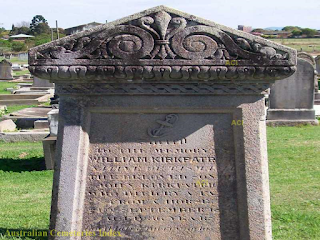 William’s father – John Kirkpatrick. The plot thickens from there. A photo album which recorded births and deaths in the family, includes the death of a John Kirkpatrick on 22 August 1895. The death certificate of this John Kirkpatrick states his death took place on 21 August 1895 at Don Dorrigo and that he was aged 78. The certificate states that he was ‘not known to have been married’ and no children are listed. Members of the Dietz family officiated at the burial. In a series of articles appearing in the Don Dorrigo Gazette in 1926, concerning a dispute as to who felled the first cedar on the Dorrigo, John Kirkpatrick is referred to several times. One of the articles, states ‘the old hands were always whispering that he had been a bushranger in New Zealand and Tasmania’ (‘Who Felled the First Tree’ in The Don Dorrigo Gazette and Guy Fawkes Advocate, 5 June 1926). So the trail leads to Tasmania it seems where it appears the most likely (or perhaps convenient) candidate to be ‘our’ John Kirkpatrick is a convict who arrived in Tasmania on the ‘Triton’ in December 1843. This convict was transported under a sentence of transportation for manslaughter (of a policeman, Thomas Jordan during an election row in Carlisle, County Cumberland). This John’s age of 22 when he arrived in 1842 places him around the same age as ‘our’ John. The convict John’s origin in Carlisle, County Cumberland (a border county with Scotland) could also verify the family folklore that William Kay insisted he was ‘Scots to the backbone’. In fact, Carlisle is known as the ‘Great Border City’. John’s convict indent records his father as James, mother Jane and siblings, William, Benjamin and Margaret. John Kirkpatrick, the convict, received a conditional pardon in April 1852. In the previous year, he had received government permission to marry one Barbara McKechnie but the records indicate the marriage did not proceed. In April 1852, John married a convict, Maria Collister who had arrived on the ‘Earl Grey’ in May 1850. While Maria’s convict record tracks her until 1854, there is then no trace of her that has been found to date. Was she the mother of William Kay or Kirkpatrick? So, I've just returned from a family history driving trip around New South Wales - and, yes, there was a lot of time in cemeteries! Of course, one of the places I visited was Barraba, the small town north-west of Tamworth where our grandmother, Selina Louisa (Louie) Brodbeck was born to Jacob Brodbeck and Elizabeth Stieger on 20 July 1892. Barraba's fortunes in the past have been as a result of goldrushes, copper, sheep grazing and, more recently, asbestos mining. In particular, a number of German immigrants took up sheep grazing probably as a result of most of them having worked for the Australian Agricultural Company which had vast tracts of land on which it ran sheep. Today, Barraba is a small quiet town of around 1,200. What strikes you though, either through a walk in the cemetery or a stroll down the main street, is how we are, in different ways, related to most of Barraba - either those resident in the cemetery or those still with us. 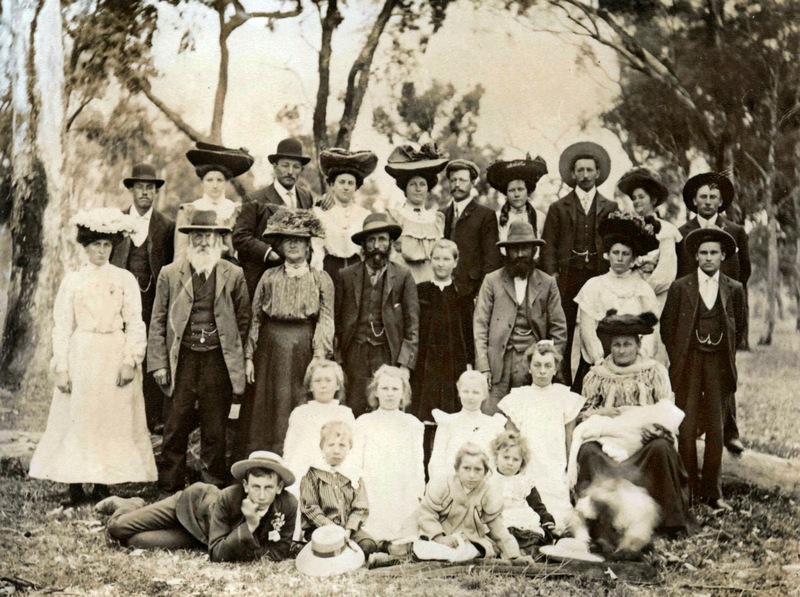 This is largely as a result of the inter-marriage of the German families who settled in the Barraba from the 1870s. It appears this was a tight knit community that worked together, lived near each other, socialised together and married each other! 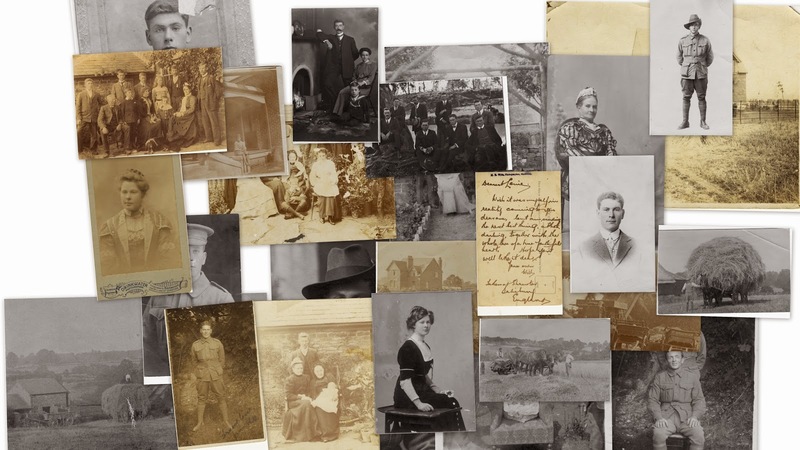 What that means is that because we are related to, say, the Stiegers, we are also related to a larger or lesser extent to the families of: Brodbeck, Groth, Schmidt, Simshauser, Mell, Garske and Doring. It also means that we have a LOT of distant cousins. For example, our own grandmother, Louie had 90 first cousins - yes, 90! Eliza had four siblings, one of whom was Caroline who married William Edward Garske. 1. Andrew (1862-1937). Never married. 2. Elizabeth (1864-1920) married Jacob Brodbeck. 3. John (1865-1888). Never married. 4. Johanna (1867-1952) married Christian Brodbeck. 5. 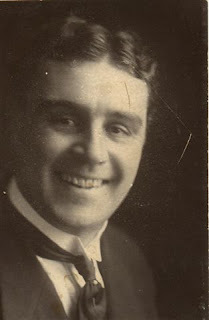 Henry (1868-1940) married Emma Jenner. 6. Edward (1870-1944) married Mary Caroline Groth. 7. Charles (1872-1923). Never married. 8. Amelia (1874-1920) married Gottlieb Brodbeck. 9. Albert (1876-1958). Never married. 10. Emma (1877-1941) married Henry Groth. 11. William (1879-1903) married Annie Simshauser. 12. Angelina (1881-1948) married John Groth. 13. Matilda (1885-1936) married Arthur Groth. So, three Stieger sisters married three Brodbeck brothers. Three Stieger sisters married three Groth brothers and one male Stieger, Edward married a sister to those Groth brothers. You could thank your lucky stars four of the Stieger boys never married! But wait, here's the free set of steak knives! Annie Simshauser who married William Stieger had two sisters. Mary Catherine Elizabeth Simshauser married Charles Edward Schmidt who was the brother of Eliza Schmidt. Annie Simshauser's other sister, Louisa Keziah Simshauser married Johanes Brodbeck, a brother to Jacob, Christian and Gottlieb Brodbeck. There are two morals to this story.....always be careful who you gossip about.....they may just be a relative and....all roads lead to Barraba! So, having readers by the 'blogload' waiting for the next instalment, it seemed entirely appropriate to throw you all off the scent by blogging about a man to whom we were never related but whose life changed the course of the family's history. How was Will Bloxham almost related to us? Will Bloxham was the fiancee of our maternal grandmother, Selina Louisa (Louie) Brodbeck. They were engaged in 1915. Sadly, World War One meant that a future as husband and wife did not come to pass. Will was killed at the Battle of Paschendale on 8 October 1917. 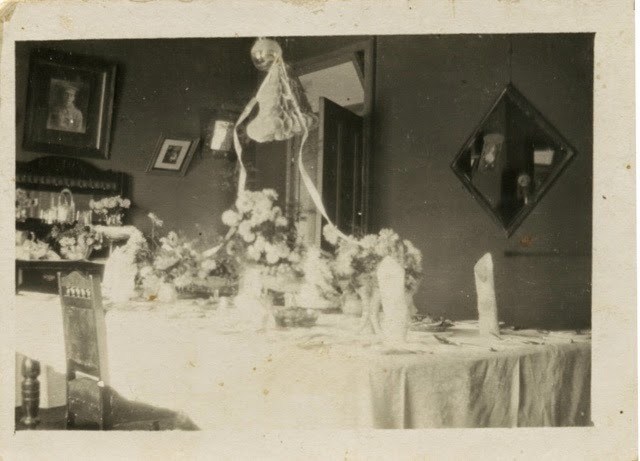 Well, it's like this.... if Will had lived (and a whole chain of other events had fallen into place), this blog would be about the Bloxham family rather than the Nott family and we may well have had our roots in a small Oxfordshire village called Hook Norton because that's where Will came from. Family folklore says that our Nana was, understandably, completely heartbroken at Will's death. To the extent that it was thought she would be the one of the family who would never marry and would care for her parents in their old age. While we know she did marry (our grandfather, Harry Nott), what 'baggage' did she carry with her after such a traumatic event? How did that affect her raising of her daughters, our Mum and Auntie Bo? At the very least, we know that part of that 'baggage' she kept all her life was all the letters and postcards that Will wrote to her from the front. And that's in addition, to all Will's personal belongings that he left to her in his last Will and Testament - his family photos, job references, Masonic lodge apron, souvenirs of his voyage to Australia and his dog tag. All of these belongings, I now have and they form an important part of the family archive. Some of the Bloxham material held as part of the family archive. Born on 25th August 1885 at Hook Norton near Banbury in Oxfordshire, England. The eighth of eleven children of Leonard Bloxham and his wife Elizabeth. The Bloxham family had a farm just outside of the village of Hook Norton known as The Grounds. Will was a book-keeper at the Hook Norton Brewery - a significant feature of the local industry even today. Will was also active in the local community. For example, he was a member of the choral society and was a church bellringer. 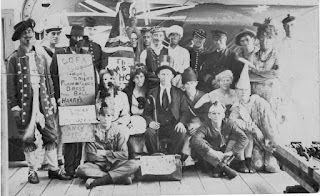 In 1912, Will emigrated to Australia on the ship "Orontes". Will initially went to Bingara in North Western NSW. 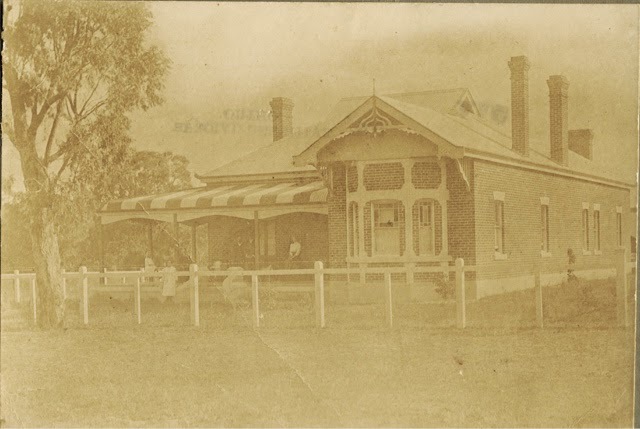 He then commenced an association with Barraba through being employed by the shop keeper at Upper Horton near Barraba. At this time, he met John Brodbeck (Louie's only brother) and the two struck up a friendship. Will and Louie were engaged by July 1914. Darling, I really think its my duty to go, they are wanting men badly and at home if the men don't respond readily enough I fear conscription will be enforced. He left for overseas in April 1916. We know he spent at least one weekend with his family at Hook Norton in June 1916. He then proceeded as part of the 18th Battalion to the battlefields of France and Belgium. During 1917 he fought at the Battle of Paschendale where he was killed on 8 October 1917. 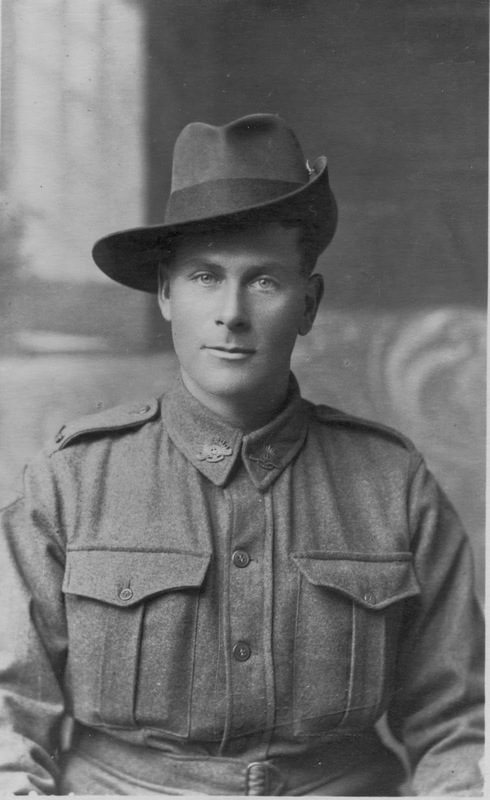 His body was not located for some months and it was not until January 1918 that Louie received the news from the local minister at Barraba, Ernest Foster, that Will had been killed in action. The course of history and the course of people's lives had been changed forever. 'Millie Creek' near Barraba NSW was the sheep grazing property of great-grandparents Jacob and Elizabeth Brodbeck. It was here where their children were born and a number of their children were married. It was the heart of the family. Please feel free to contact me at mchk@bigpond.com about the family history. Please comment on the blog with your own information and memories! Click on 'comment' above - sometimes it will say 'No comments' (in which case you could be the first!) or a number (eg. 5 comments).